Nowhere near as irredeemably bleak as Zanskar out west, Nubra Valley, to the north of Leh, nonetheless has a stark beauty about it, and is also generously blessed with comfortingly verdant vistas. Entry into Nubra is suitably dramatic – on the Silk Road of old, across the Ladakh Range via the Khardung La Pass (18,379ft, 5602m), the world’s second highest stretch of motorable tarmac (often covered in permafrost even in summer). The valley itself is a broad and flat expanse dominated by the zigzagging Nubra and Shyok rivers, and bordered by the mighty Karakoram Range on one side. 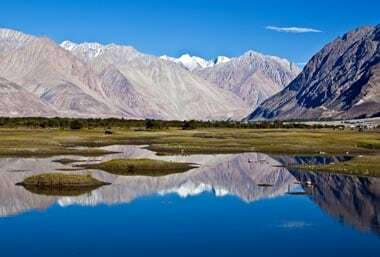 With villages clustered fairly close together, and pockmarked by early gompas and ruined palaces, Nubra Valley makes for superb – and picturesque – trekking territory. Until 1994, tourists were barred from entering Nubra Valley; before then, the last time an outsider had stepped foot in the region was back in the 19th century. Nubra’s kings of yore ruled from a hilltop palace in Charasa, situated opposite Sumur, the valley’s main monastery. The valley was once an important stop on the Silk Road – to the northwest is the Karakoram Pass connecting Nubra to Xinjiang in China. The valley’s mountain spine looks to the Nubra River (east) and the Shyok River (west). Towards the north and east is the formidable Karakoram Range, the Indian border with China and Pakistan. For a land that looks arid, the valley is actually fertile ground: apples and apricots are grown here, as is barley, while berries of the seabuckthorn shrub are harvested. The valley’s climate, in contrast to the extremes of Zanskar, is relatively milder. While temperatures dip well below freezing in winter, summers are warm with highs of 30C. However, sandstorms are common around here. The road into Nubra is open through the year, as this goes to the high-altitude battleground of the Siachen Glacier, the biggest glacier on the planet. From Leh, buses head to Panamik via Sumur, and to Hundur via Diskit – returning the next day – three times a week. Jeeps can also be hired from Leh. 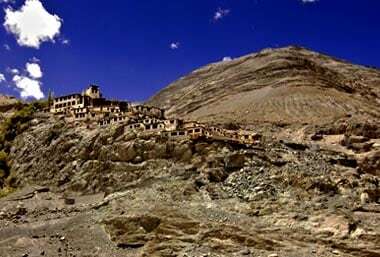 The Khardung La Pass is 37km from Leh. There’s a daily bus service between Diskit and Panamik, via Sumur, and there are local buses from Diskit to Hundur. From Diskit, you can hire a taxi to explore the valley (with a trip to Panamik and Sumur thrown in).